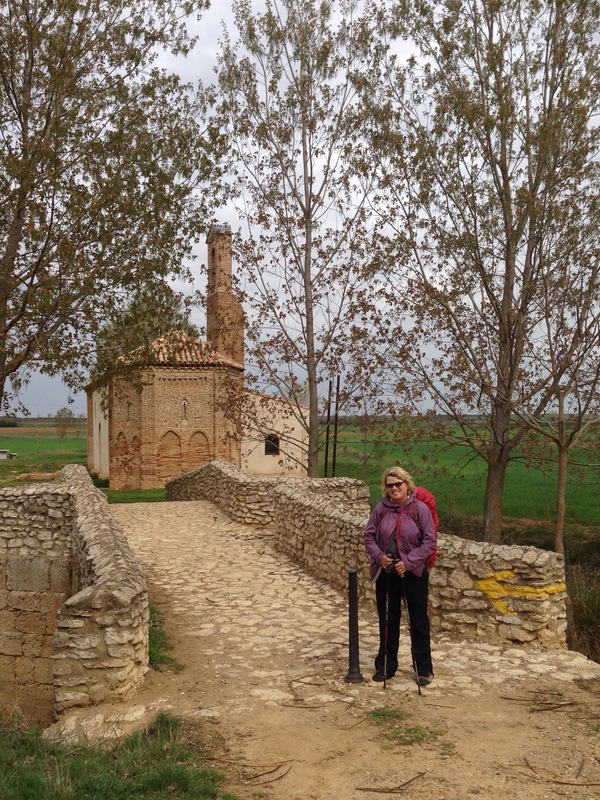 My 6 kilometer walk from Reliegos to Mansilla de las Mulas didn’t take very long, even with a limp. It was perfect walking weather: cool with a breeze, and big, fluffy white clouds sailed in a blue, blue sky. 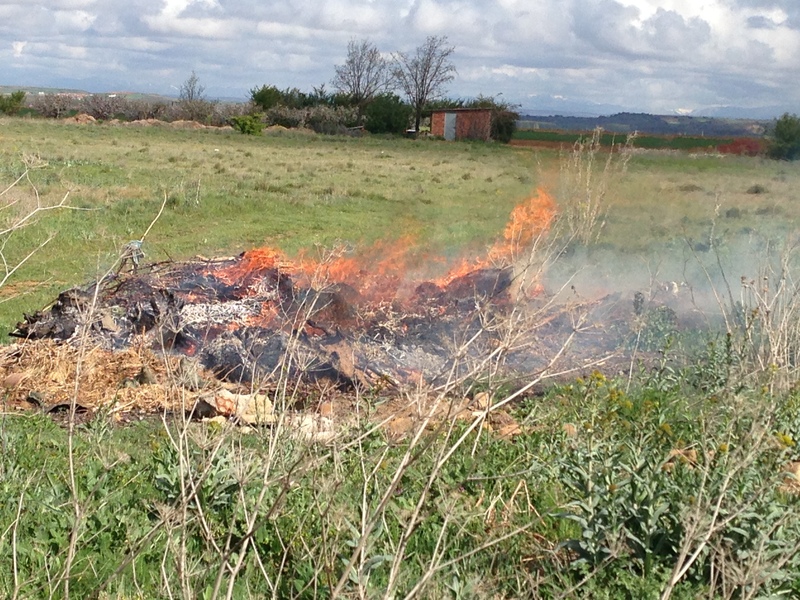 Out in the country I saw this fire burning unattended. It was such an unusual sight for this urban Californian, I had to take a photo. Way in the background you can see a little fringe of snow on the mountains. Mansilla still had its medieval walls, and it seemed like it had walled itself off from the 21st century. The stores on the Plaza Mayor sold fabric and craft supplies, children’s clothing, and toys. All of them had dusty windows and were closed for siesta. I’m amazed how Spain is largely unspoiled by chain stores or fast food restaurants. 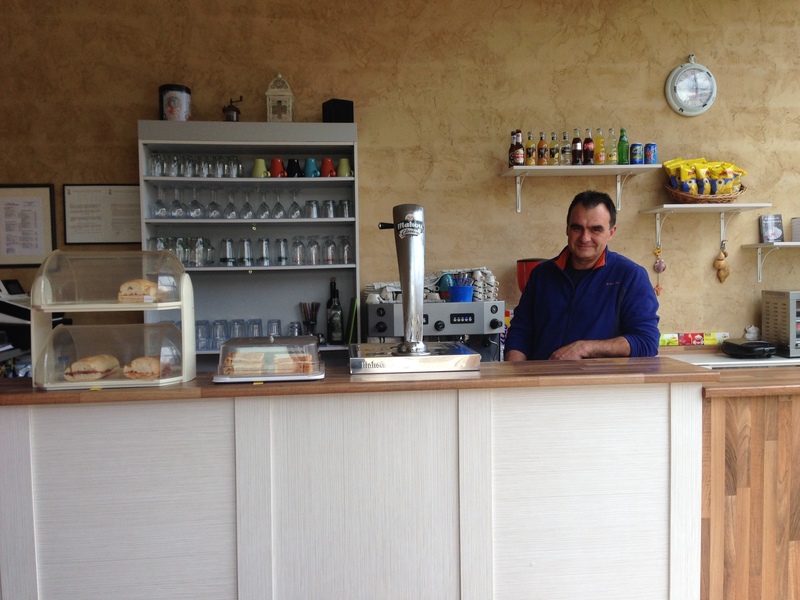 Not a Starbucks in sight outside of Madrid! 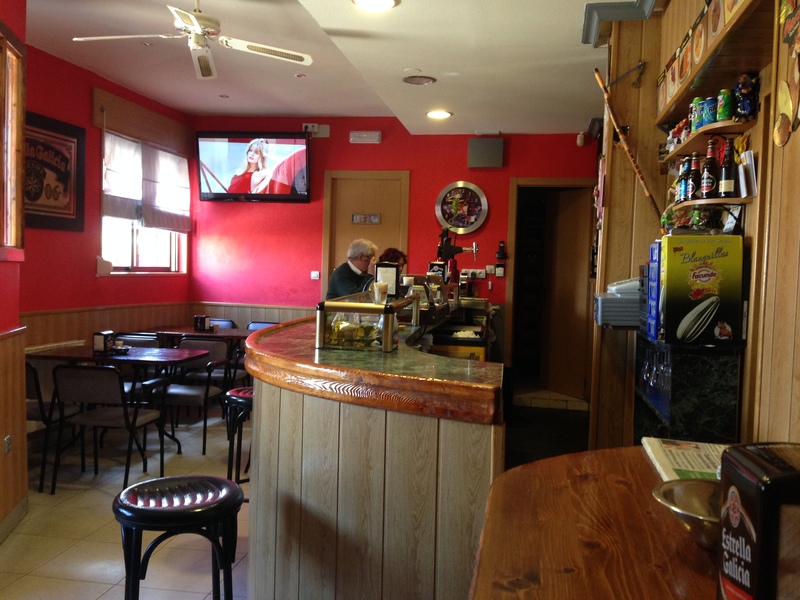 My friend Nancy had recommended a place to stay in Mansilla called Albergeria del Camino. I’d sent my big pack there from Reliegos that morning. It turned out to be a cute little hotel with just four rooms. When I walked in the entryway the owner said, “oh you’re the one who belongs to this pack! I didn’t have a reservation for you, but I have one room left!” He showed it to me and it was so cozy! He said, “this is the best bed on the Camino!” It was the Spanish version of a Tempurpedic! I couldn’t resist. After a soak in my own tub, and blow-drying my hair for the first time in several days, I went downstairs for a late lunch. 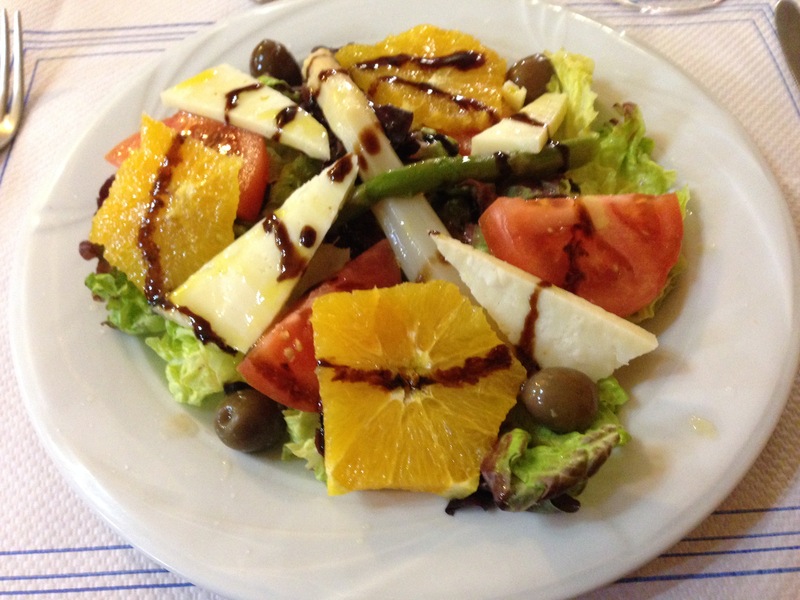 The Ensalada Mixta was a cut above the usual pilgrim menu. I had definitely kicked it up a notch by staying at the Albergeria. 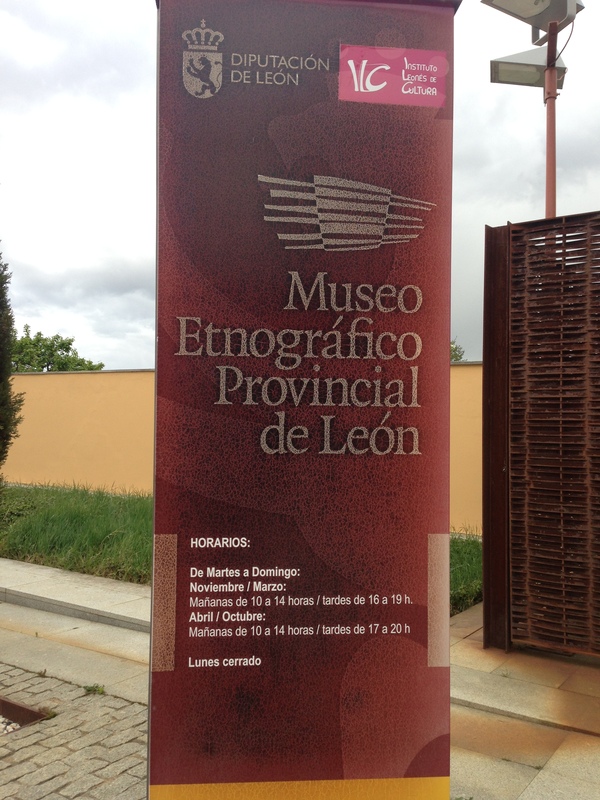 Javier, the owner, recommended I visit the Provincial Ethnographic Museum of Leon about five minutes across town after lunch. Wow! What a fantastic place! I wish it had more presence on the web so I could post some links. It was a Smithsonian quality museum about the history and culture of the people of the Province of Leon placed in a former Monastery. It had three floors of exhibits of all eras of history going back to before the Romans. Fashion, furniture, photographs, jewelry, traditional farm equipment, looms, spinning wheels, and other artifacts were all arranged by century and theme. Visiting the museum was just the right thing to do that afternoon. 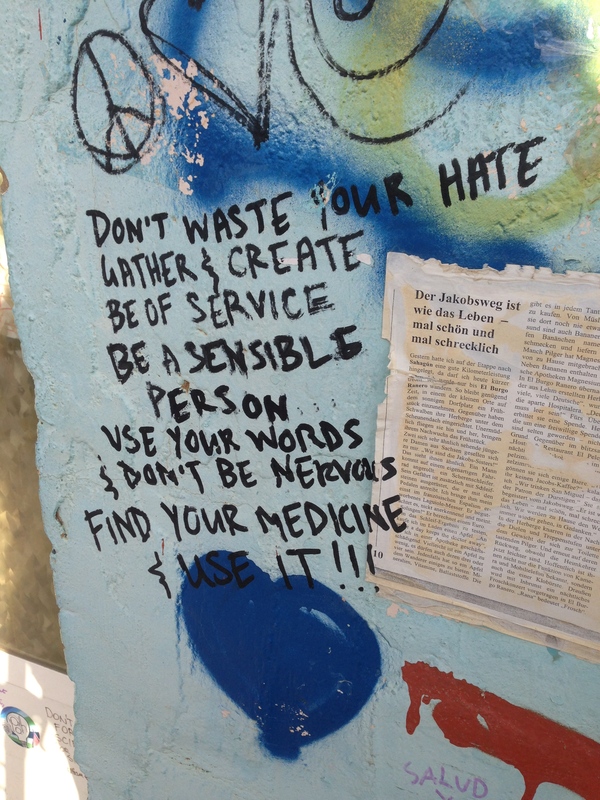 I’d fallen in love with Spain and I wanted to understand it better. So many times I’d wondered, “What did this place look like before it began to crumble? What did the people wear 100 years ago? 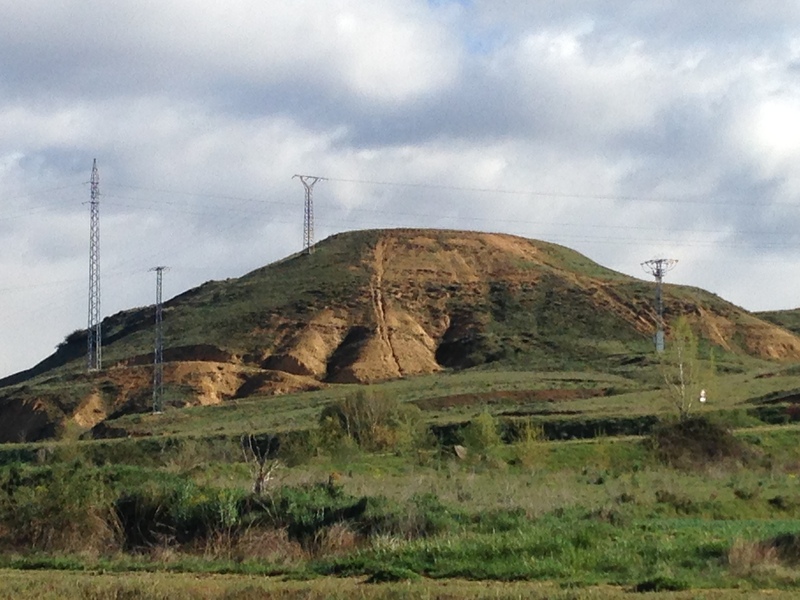 What is the terrain like a little off the Camino? What is that mountain range? I wonder what happened here during the Civil War?” That afternoon in the museum helped me integrate something of what I’d learned and observed along the Camino. And lots of the exhibits were in English. I wandered back to the hotel taking my time. It was a luxurious feeling to not be in a hurry. Perhaps that was one of the themes of Camino 3.0. Taking my time. 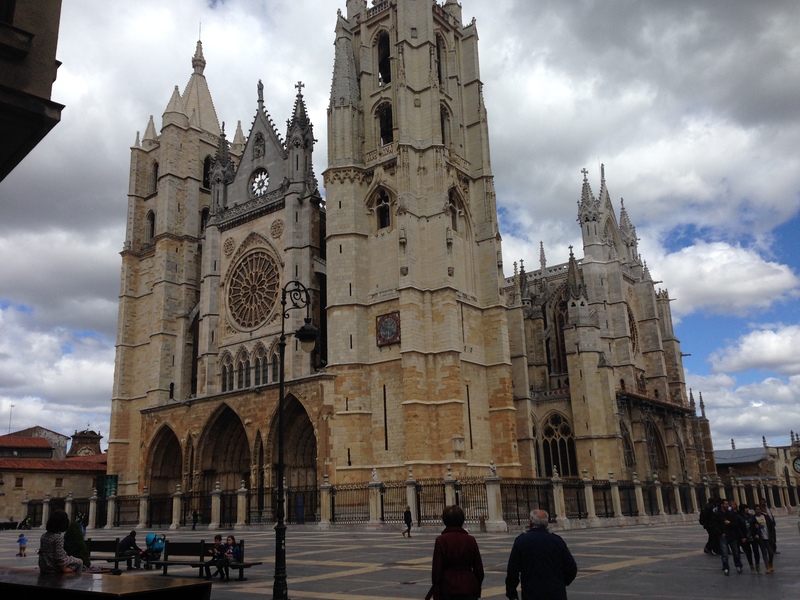 I walked out of town a bit, investigated the Camino route for my exit tomorrow. It crossed another rushing river, and as I looked back, there was a nice view of the walled city. Back at the hotel, my room faced the church. The stone glowed in the evening light. 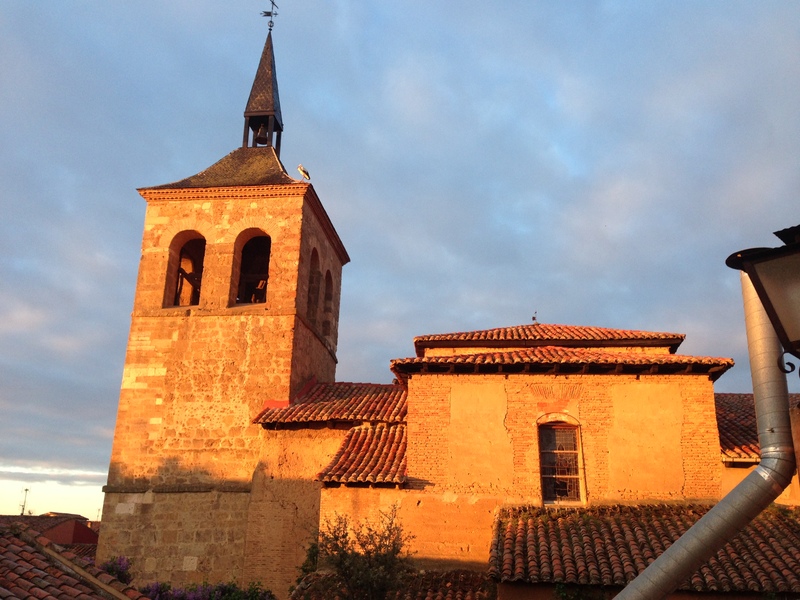 I rested on my “best bed on the Camino,” with ice on my ankle and watched the stone of the church change color as the sun went down. One of my stork friends was hanging out on the roof. 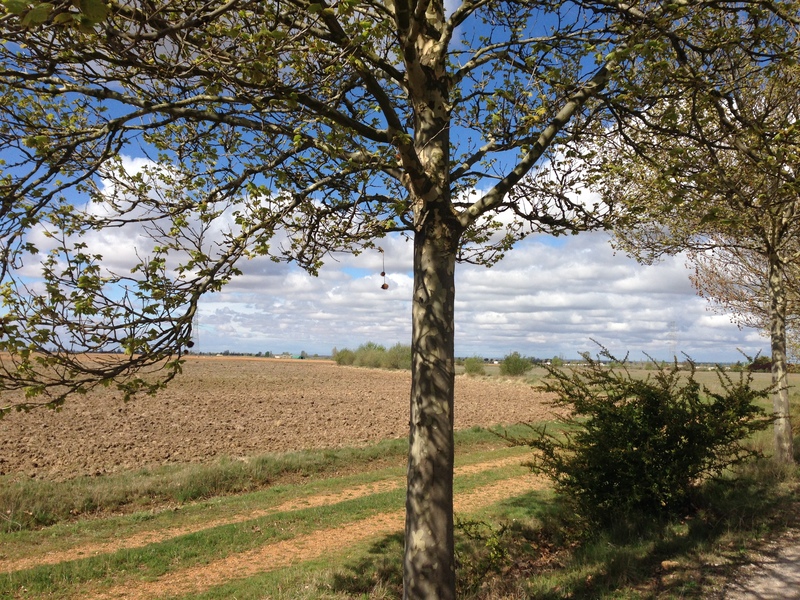 Seeing the storks in their nests all across the Meseta was one of the joys of my Springtime Camino. Eating dinner in the dining room I noticed that by staying at the Albergeria, I’d shifted uptown into a more affluent crowd of pilgrims. Lots of people on the Camino ship their luggage every day, and stay only in hotels, or travel in organized groups, but for the most part, I had been hanging out with the backpackers. Among that crowd in the dining room I felt like I was transitioning back into my regular life, and also teetering on the cusp of being a tourist. It felt very comfortable and it also made me a little sad. A group of five Irish women sat at the next table. They were very jolly, and we talked over dessert. They walked together for a week on the Camino every year. That’s more of a European approach—to do it in chunks. Right then I wished I was walking with a group of old friends, too. I was contemplating whether to walk all the way to Leon in the morning. It seemed like a prudent thing to get a taxi into town at some point with my sore foot. What did it matter really? It would give me more time in Leon. 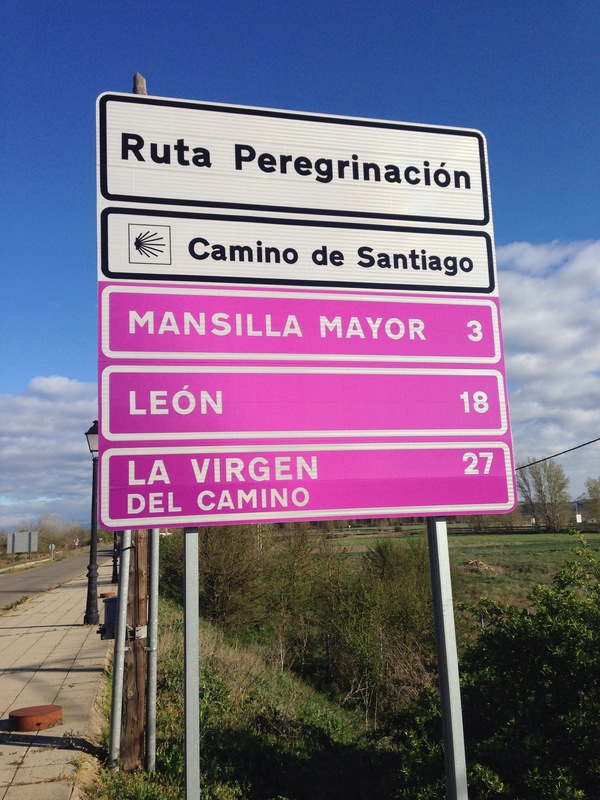 I’d finished the missing link of my Camino. I went to bed feeling conflicted about it. Tomorrow was my last day of walking. Just 18 kilometers to go. I wasn’t sure how I felt about that. 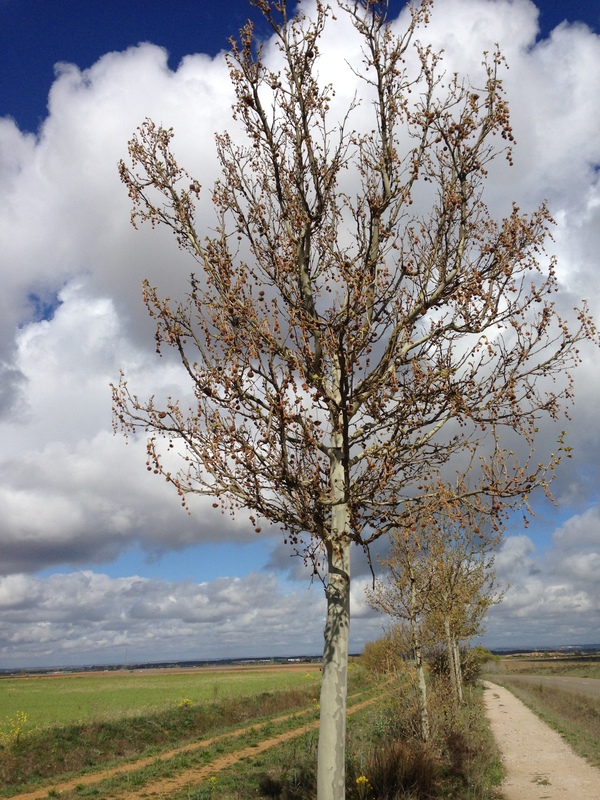 There were many reasons I wanted to walk the Camino this spring. 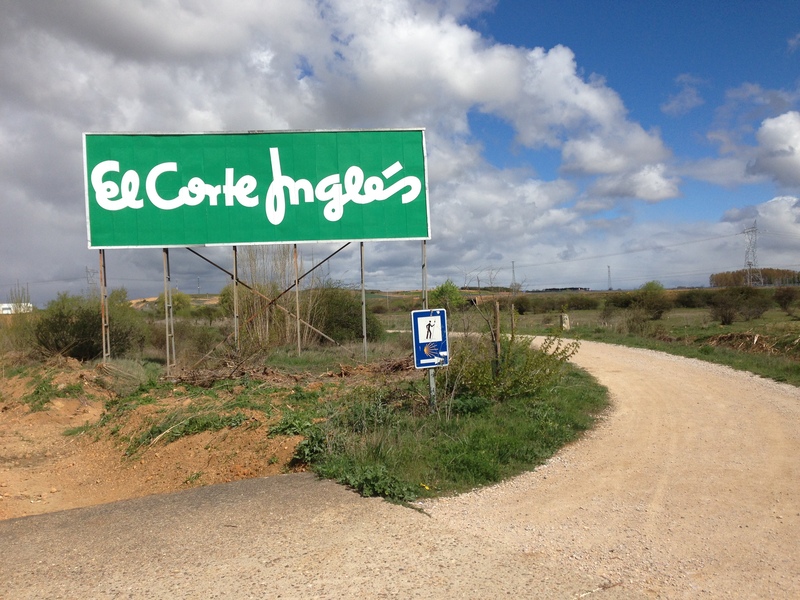 To finish, of course, to fill in the missing piece of the Meseta that I’d bussed through in 2013. There was also a desire to have some time to reflect and meditate. 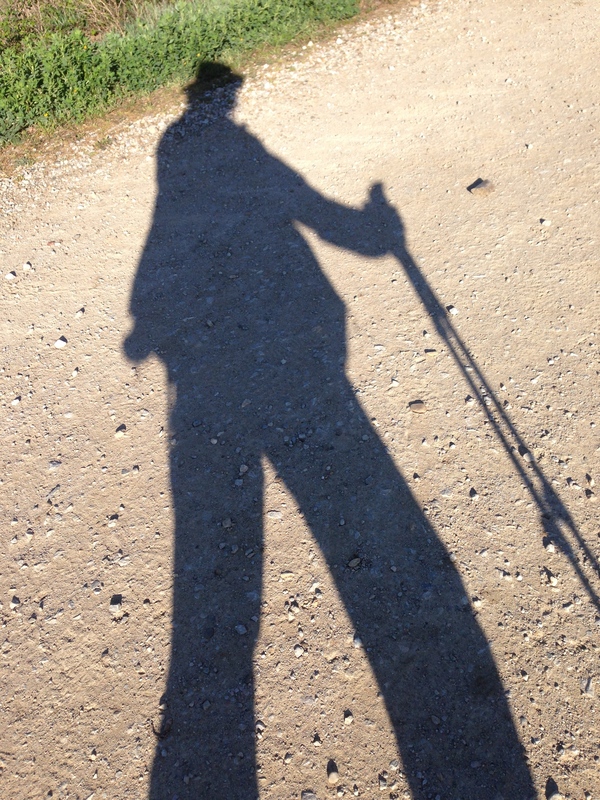 The Camino gives you many hours walking alone. I felt like I needed some time to listen for what God wants me to do next in terms of ministry. What is life-giving? How can I offer my gifts? Some of those questions got muffled by the meeting of people and the physical challenge–and fun–of walking again. Then the day I left Sahugun I decided to carry everything that I usually shipped in my daypack, and I walked 20k to Burgo Ranero. It felt heavy, but I felt strong enough to carry it. Well, the extra weight really pressed on my weak point, my ankle tendons. My left foot was hurting the next day. One of the lessons of the Camino seems to be that I have to learn some things over and over again. The next day I had to go slow, and there was grace in that. It was a contemplative day. I saw the beauty of the simple things: the trees planted along the senda pathway, and how they created a rhythm. You could interpret it as monotonous, but that day they were like prayer beads along a string, one after another, predictable, and pulling me along. Periodically, along the path, there were monuments with the Cross of St. James on top. I sat down on one, and no one came by for a long time. I was alone. There were stones left on the ledge. and on top. I took my pack off and found a stone or two to add. It felt good to bless each one with a thing I wanted to leave behind. Then I noticed the freshly- plowed fields, and the red earth. The Camino was plowing my soul, getting it ready for the new thing that I hope God is planting in my life. There were lots of examples of new life along the Way. 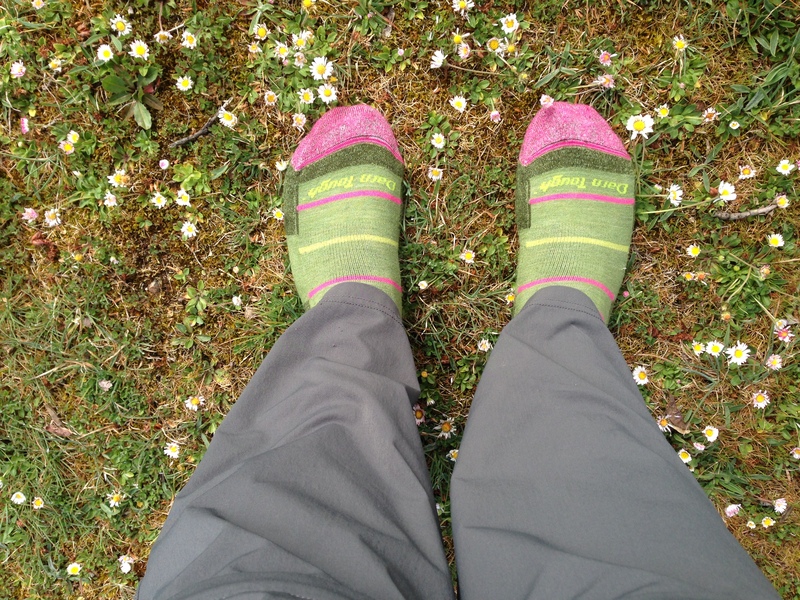 I spent some time reflecting on what it meant to walk in Eastertide. I was walking in the midst of a beautiful Spring–much more dramatic than at home in my drought-striken Bay Area. It was a long time since I’d experienced a real Spring. 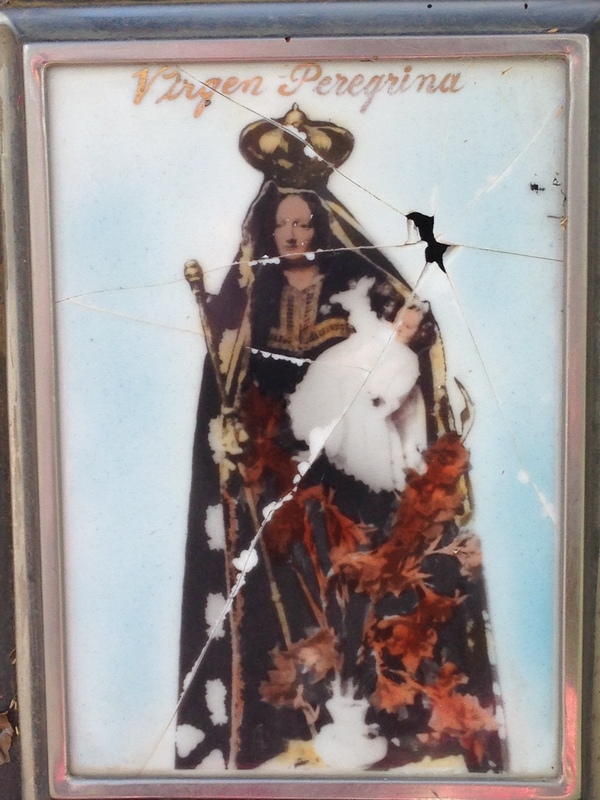 It made me think of the contrast with all the crucifixes in the churches I’d visited along the Camino, and the tradition of Semana Santa–Holy Week processions–in Spain. There was so much emphasis on Christ’s pain. Out here in the campo, the church of the Earth, I felt the overwhelming power of the Resurrection pushing up new life, renewing everything. I could feel the earth humming with energy. Christ was here, on the Camino, renewing us pilgrims, and the whole Earth, giving of himself. Going slow was a good teacher. Once again, I said “gracias” for all that God, through the Camino, revealed to me, and would reveal to me in the future. 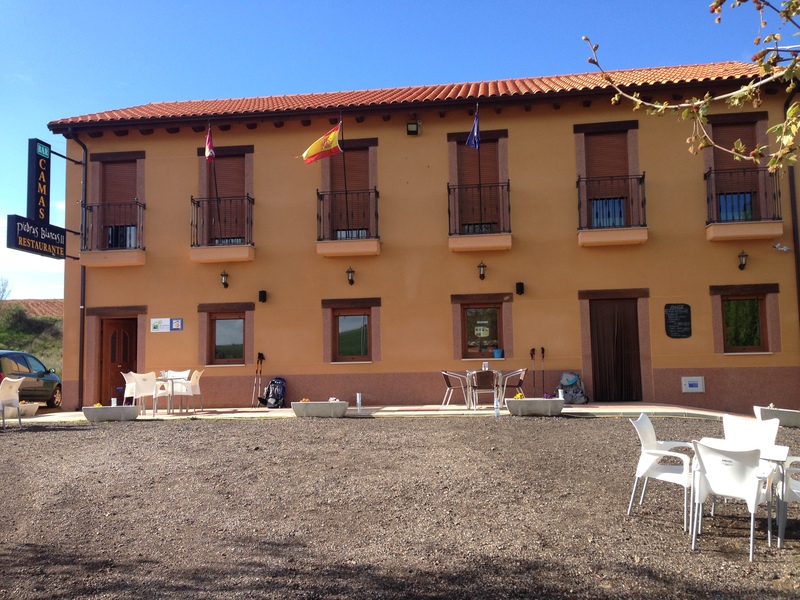 Tami and checked into a cute Hostal run by a French couple at the point where the Camuno enters Sahagun. We both had our own rooms. I was ready for some privacy, and my own bathroom. The room was tiny, barely bigger than the two twin beds pushed together, but it was very cozy and looked out on the Camino. And it clear with a hairdryer. My feet were killing me. So I lay down on the bed and elevated them, and caught up on the blog a bit. I’d sent my daypack into a different Hostal that I’d picked out from the Brierley guide. After my feet felt better I went out to find it. No luck. So I went to find some lunch. Walked downhill deeper into Sahugun and there weren’t many places open. Lots and lots of “Se Vende” (For Sale) signs and boarded up shops. It was a reminder of how bad the economy still is in Spain. At the bottom of the hill I ran into Bill and Aimee, whom I’d met atAlbergue Jacque de Molay. They were in search of lunch, too, and I joined them. Turns out they live in Santa Fe but are both from central Louisiana, where Hale is from. We had a great time sharing our stories and enjoying a notable lentil soup with chorizo that had the depth of flavor of a Gumbo. They raved about a place in Mexico called San Miguel de Allende as a place to learn Spanish.They go there all the time. I was struck by the synchronicity of meeting them and Nancy, who both had “CenLa” connections. After lunch, I found the Hostal where I’d sent my daypack and regretted sending it there. The proprietor answered the doorbell and really wanted me to check in; he was desperate for business, but I had already checked in at the other place. I didn’t quite feel unsafe, but I was uncomfortable. It was another reminder to me how bad the economy remains in Spain. I talked with the owners of my Hostal in the lobby about it. Clearly, it was the very beginning of the Pilgrim Season. I think there were only 3 people staying in their place that night. Our disjointed conversation in Spanish and English, with a French overlay (which I don’t speak!) 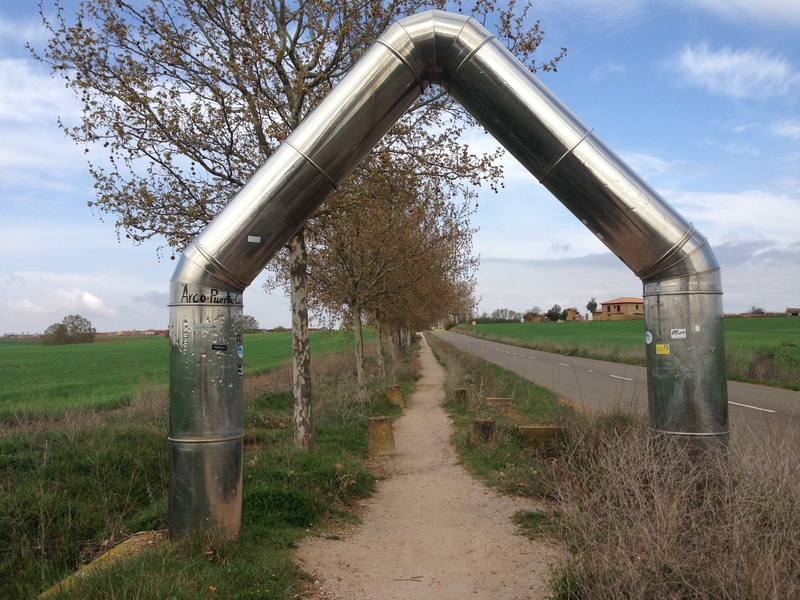 made me aware of how flexible people are on the Camino about communication. They’re comfortable using a kind of Esperanto of whatever language works, and aren’t afraid of trying something. I’d entered the zone where I was comfortable not understanding everything that was said. I seemed to understand enough, and know when to ask for clarification–or not–and that was ok. We don’t ever live in that space at home. 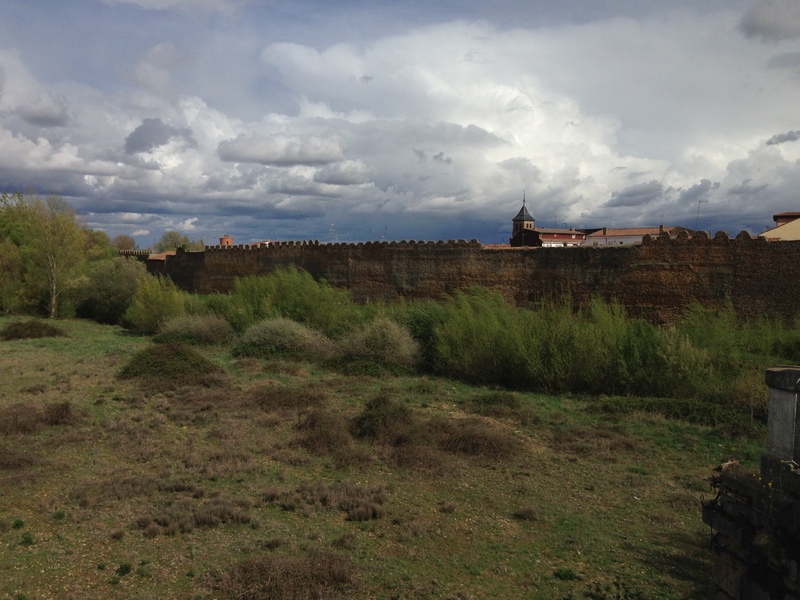 Sahagun was a little disappointing, a lot of the really old churches I wanted to visit were closed. But later that night I got together with Tami, and Andrew,from England. We walked to the ruins of the 10thC Abbey, and Andrew was very knowledgeable about them. Andrew and I had talked several days before about the psychological dimensions of saying hello and goodbye to so many people that you meet on the Camino. It gives you insight into how you make friends in real life. 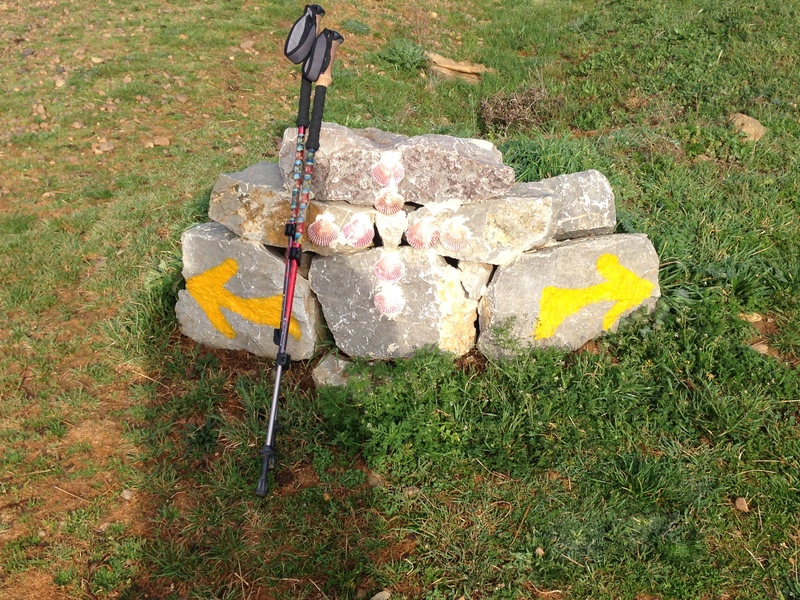 The same patterns apply on the Camino, but they’re amplified. Now that I’ve walked on the Camino three times, I realized that I was thankful when I met people and I shared contact info with some people, but I was able to appreciate them and let go. I did not need to be “with” a group or a buddy the whole time. There was a difference, too, because I wasn’t going to Santiago. It gave me a somewhat unique perspective. Most pilgrims had to keep moving quickly to make time on the long haul across Spain. 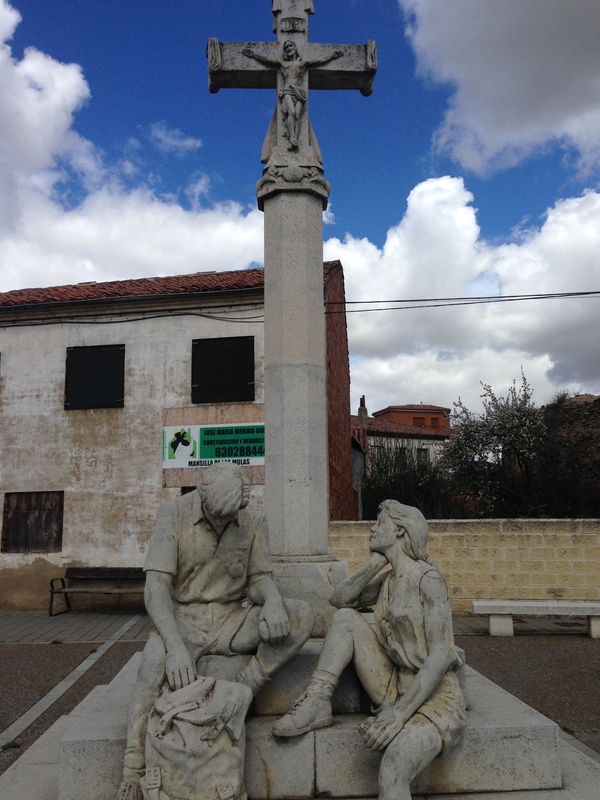 I was reminded of that when Tami and I entered Sahagun, where there’s a monument that marks the halfway point to Santiago. I had moments of wishing I could continue further—the stretch past Leon to Molinaseca might be my favorite segment—but I was also thankful to be doing a shorter pilgrimage, and to be present to the charms of the Meseta. When I left Albergue Jacque de Molay I had one of those first thing in the morning thrills of freedom. The day was wide open, and exciting. I love that feeling! Zing! My legs felt strong, and everything I had was on my back. (Well almost everything. My daypack in the vestibule waiting for Jacotrans.) I wonder why I don’t feel it more often. It must be all the endorfins. The Camino followed the Autovia for most of the day. 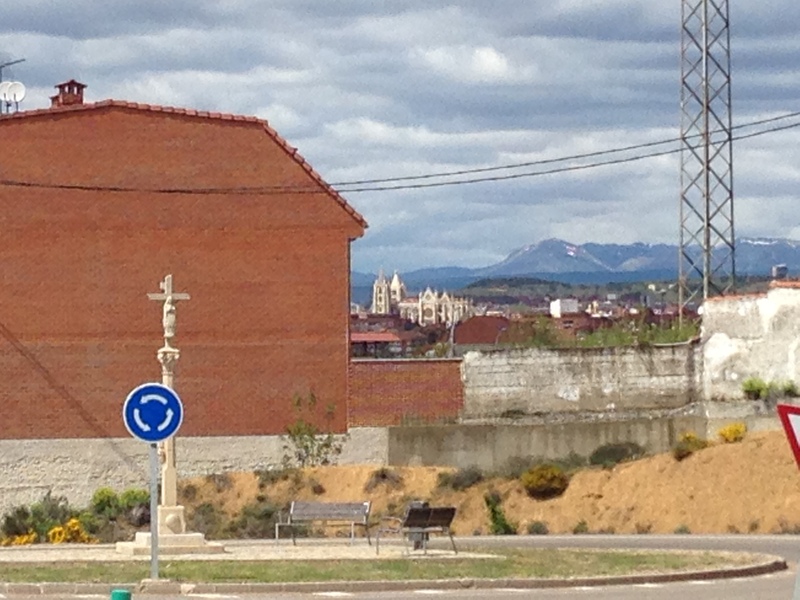 I enjoyed the huge directional sign that pretty much described my Camino 3.0: Burgos to Leon! We also passed out of Palencia and into Leon. The way marker looked like it predates the Autovia. I love the layers of ancient and modern along the Way. It was good to see her, and we walked all the way to Sahagun together. We’d only met a few days ago, but it felt like I’d known her a long time. She and I were comfortable saying hello and good-bye, and wordlessly knew when to give each other space. 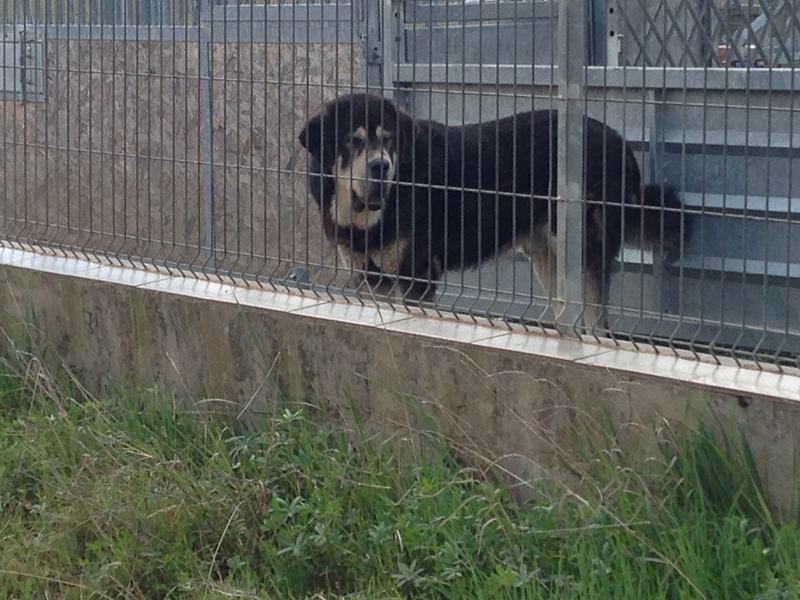 We both wanted to experience the Camino solo, but enjoyed each others’ company. 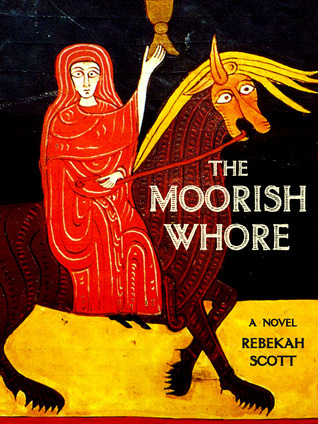 She had walked the whole Camino multiple times. 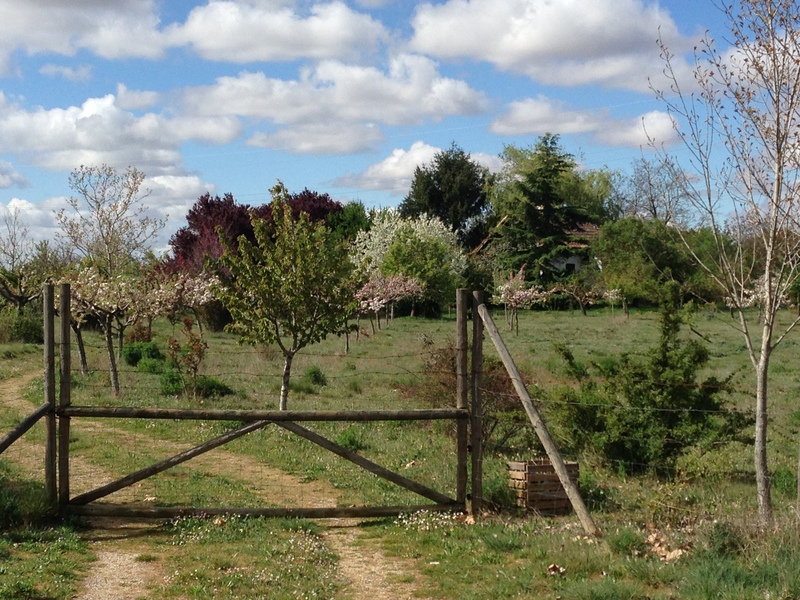 The rigor and beauty of the Camino challenged her and gave her peace, as it did for me. Her more evangelical vocabulary of faith was different than mine, and yet we talked about God and I enjoyed her perspective. She talked about “knowing Christ,” and it made me think, “do I know Christ? I strive to follow him, and worship him, but do I know him?” Thought-provoking. The last few kilometers to Sahagun were tedious. 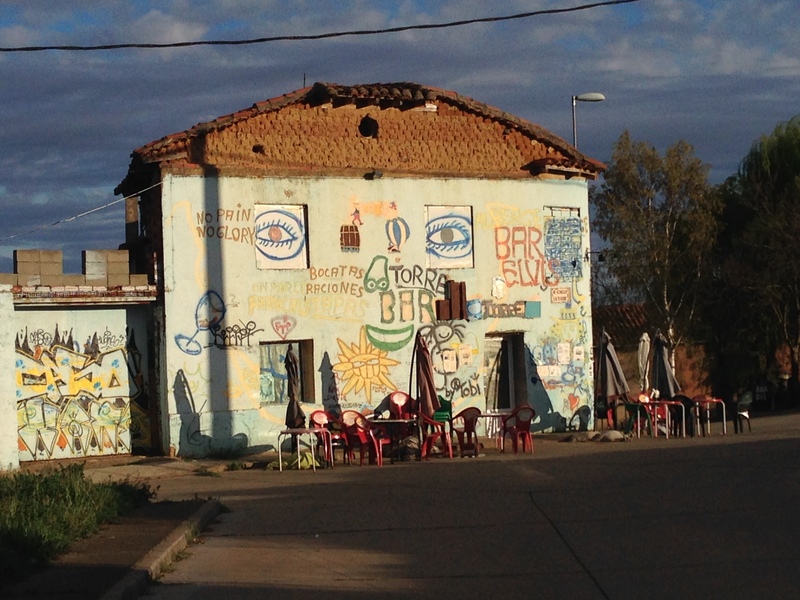 The Camino wound through a lot of indescript and abandoned houses with “se vende” signs. Just as I was going into “grind it out” mode we came upon a spot that had a strong spiritual energy. It was a like a place out of time: a little Roman bridge that crossed a fast-running river. The weeping willows were leafing out and there was an ancient (locked) chapel on the other side. We stopped and took pictures. There’s that saying that pets cross over “the rainbow bridge” when they die. 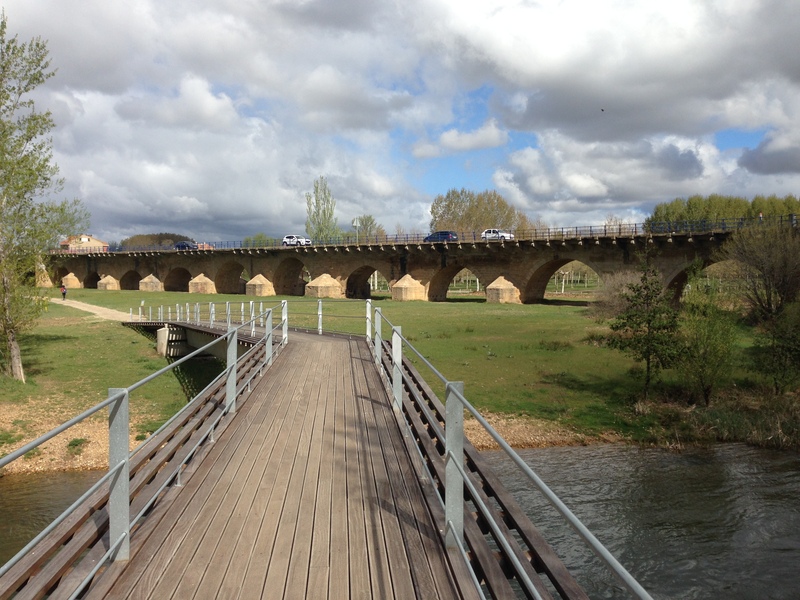 I wonder if I’ll cross over one of the many beautiful bridges on the Camino when it’s my turn. My short day to Carrion had a strategy to it: the next stage on the Camino is a whooper, and I wanted to be rested for it. 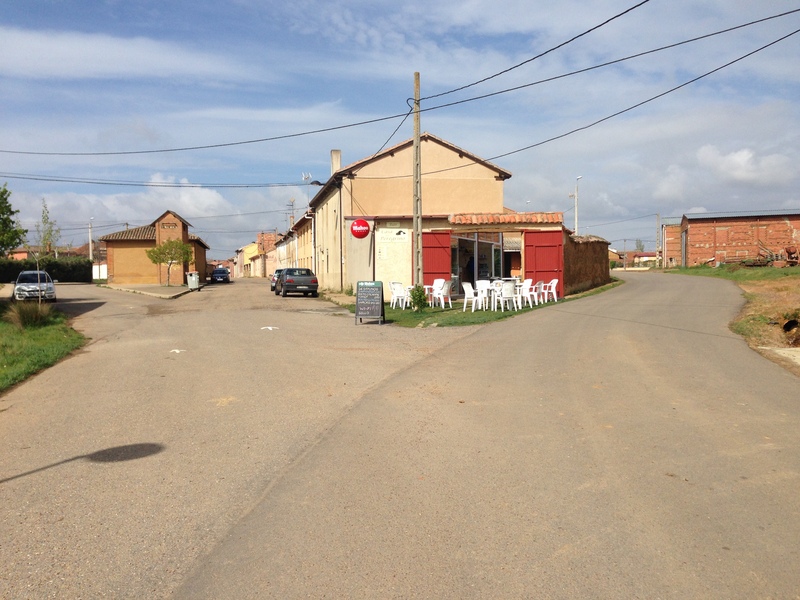 The first section is 17 k on the flat Meseta without any services, including water. This was where I was thankful it was April, not July. 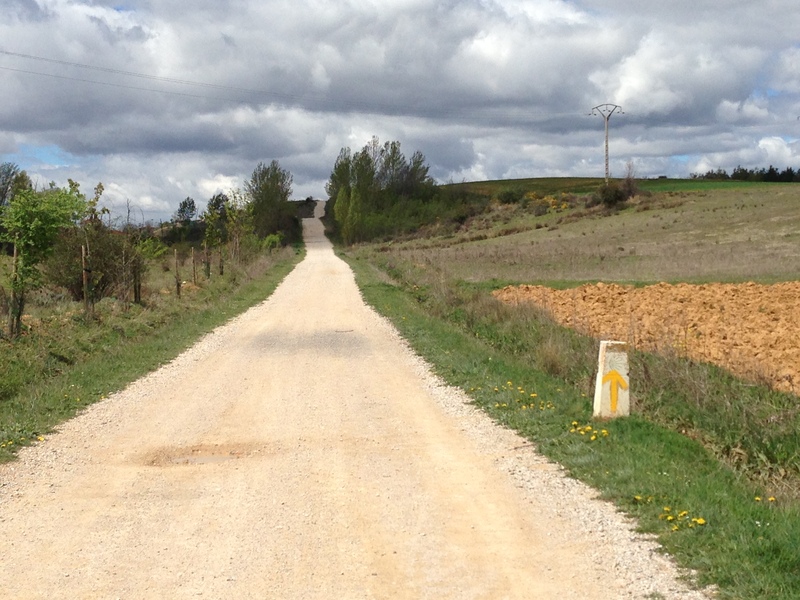 The dotted yellow line is the Camino. I could have stopped at Calzadilla, but I got caught up in the excitement about a 27k day to Terradillos, and went for it. It wasn’t too bad, really. Sun and clouds, no rain, cool temperatures. The first couple of hours I listened to the birds and was lost in my thoughts. The second couple of hours I listened to old favorites like James Taylor’s “Sweet Baby James” album, and John Denver’s “Rocky Mountain High” singing along as loud as I pleased. Then there were a couple of necessary pit stops. None of those services, either. Had a big salad for lunch at Calzadilla. The bookmobile was also in town. The afternoon was harder. Just when I was feeling draggy, a Dutch woman came up alongside me and we talked for the next two hours. Her name was “Jacqueline, like Kennedy” and we had a fun time. Turns out that she is from Neighmegan (sic), the same town Hale and I visited when we hitched a ride inParis with a Dutch couple named Meip and Albert. They took us home with them. They had three little kids, who must be forty by now. Jacqueline had 20 year old twin boys, and was a widow. 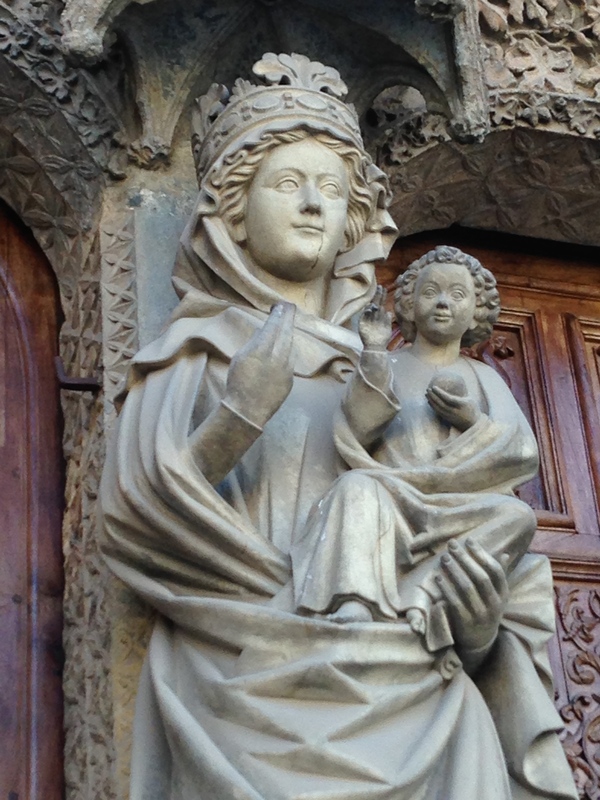 We talked about kids and husbands and our Camino experience. She was going to Santiago. At the end of the day we got to Albergue Jacque de Molay, and just about fell in the door. Bride of Frankenstein. 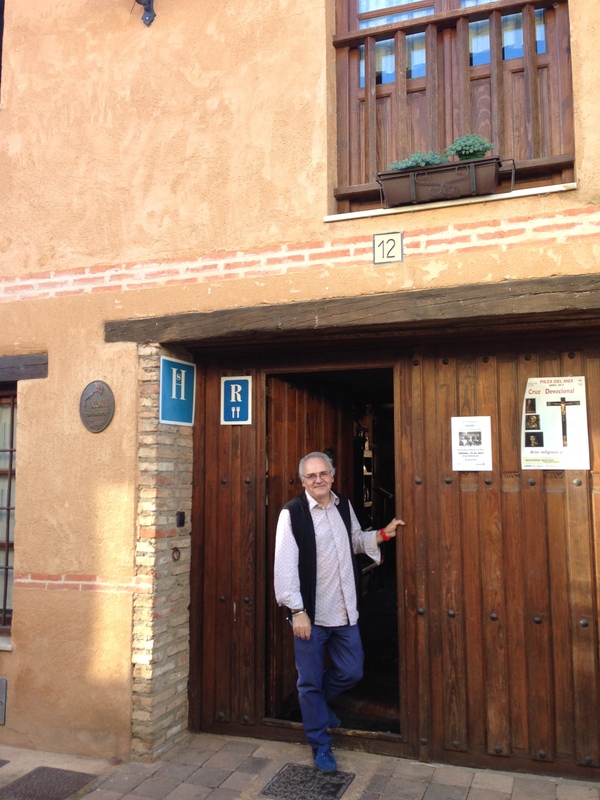 The Albergue was one of those Camino oases run by a family who know the needs of pilgrims. They washed your clothes for 7€, a bed was 8€, and dinner was 10€. There were 4 young Korean women in my room and Jacqueline. So it looked like a snore-free night. After some Spanish ibuprofen 600mll, and a shower, we all gathered in the dining room and had an excellent meal. I had my only trout this trip. I sat with a Spanish woman from Pamplona, a Swiss woman, and a Finnish woman. My Spanish got a workout, but the Swiss womsn did some working around in French. Jacqueline was reunited with her pilgrim family, a boisterous group. I wished I could have joined them, but I was too tired to be boisterous, and went upstairs to enjoy a full nights’ sleep on my bottom bunk. Hello, friends of the blog! I’m 8k away from the Cathedral in Leon,my final destination. If any of you are up right now can you send me some energy? I’ve got the a case of the Pilgrim limp and taxi temptation.